This lovely boy is Dylan. Dylan came into HCBW in March 2019 at just 10 months old. He is a gorgeous Red and White natural bobtail Boxer puppy who has now found himself a lovely new home to fulfil his particular needs and help him reach his full potential. We are very pleased to say that this beautiful boy has now found his forever home and we wish him and his new family lots of success with his future training! Dexter came into HCBW in March 2019 at just 15 months old and he is a real beauty but he is not the dog for the faint hearted or inexperienced. We are pleased that we have found a permanent home for him with a boxer savvy family where there are no children and no other dogs, cats or other small furries. He came from a very busy home where he was in a permanently excited state and was not enjoying the level of socialisation he needs. Although not aggressive, he was most frequently distracted and did not focus. He can take a while to calm down. He will pull on the lead and can lunge at other dogs. Walking him is a challenge but he does respond to treats en route to encourage better behaviour. We wish his new adoptive family all the best in working with him to achieve some calm and balance with one-to-one attention and training and we are sure his wonderful character will shine through and he will be a lovely boy! A lovely boy who went into foster to receive some TLC and to help him gain some weight. It worked so well that he and his foster family decided he should stay so he happily spending his days in Kent. Ted is a three year old neutered brindle and white boy and was looking for a new home. Ted had been living with a female who was a nervous dog and when out walking he seemed to feel the need to protect her and could be difficult with other dogs. He is a small chap, very happy, friendly and playful. As he can be boisterous we were looking for a home for Ted without children under 12 years of age and although he has lived with another dog we felt he would do best as an only dog in the household. 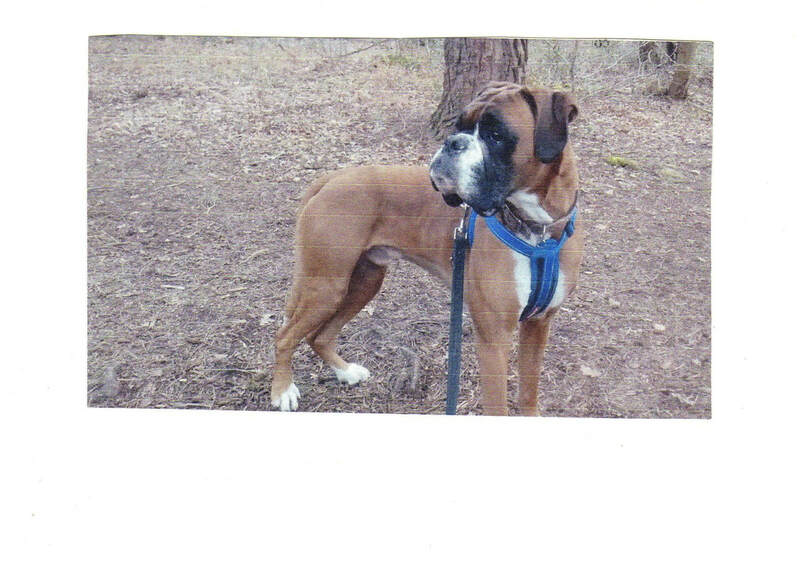 Troy came into HCBW at 5 years old, he was looking for an experienced Boxer home, with someone who has time to work with him on his manners! He has lived with another Boxer previously. He's a big lad, who has a strong will, and a determination to get what he wants. He gets on well with other dogs and walks well on the lead. Troy spent some time in one of HCBW's wonderful foster homes and his new adoptive family slowly got to know Troy over a period of weeks, spending time visiting him and gaining his trust. We are so pleased Troy headed off to his new home recently and wishing him and his new family all the best for the future. Missy is such a lovely girl, a real character, friendly and loveable. She came to HCBW at 6 years old and was re-homed for a brief period but found her new home a little too busy and it took a little time to find that perfect match with the added set back of an operation on her leg and the recovery time. We are so pleased that Missy finally set off to her new forever home on 11 June 2018 where she has a quiet place to relax and enjoy life. She is such a friendly, sensitive soul and we wish her and her new family all the very best for the future whilst she is settling in to her new life. Millie came to HCBW around middle of May and instantly found her forever home. Millie was just 9 months old when she came to us and had lived with her Boxer friend who she adored but unfortunately due to a relationship breakdown she had to find a home where someone would be around to help her continue with her training. 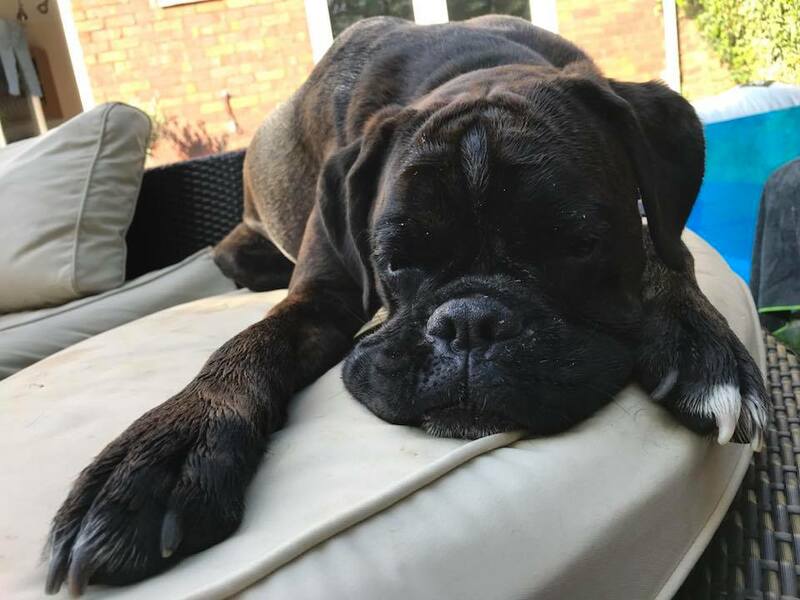 Millie landed on her paws, as she has someone at home all day and the company of a gorgeous female Boxer, Doris who she met and went home with on 3 June 2018. Doris has accepted the new bouncy addition to the family and has even started to chase the ball around the garden again! Millie has settled very quickly and has made friends everywhere she has been on her adventures so far. We wish Millie, Dorris and her new human family members many years of happy times ahead! Buster came to HCBW in May 2018 and had a home instantly, whilst the Royal Wedding was going ahead on 19 May Buster was on his way to his new forever home. Buster is a wonderful boy, nearly 4 years old he is well trained and friendly with everyone and everything! Unfortunately for Buster and his previous owner they just couldn't be around for the time that he needed. He originally grew up with a Husky dog in Australia so is a well travelled boy! His new family live by the coast and he enjoys a morning stroll along the beach chasing the waves! Buster has made new friends wherever he has gone and is loving having people around all day! Good luck in your new home Buster, we know everyone has already fallen in love with you! 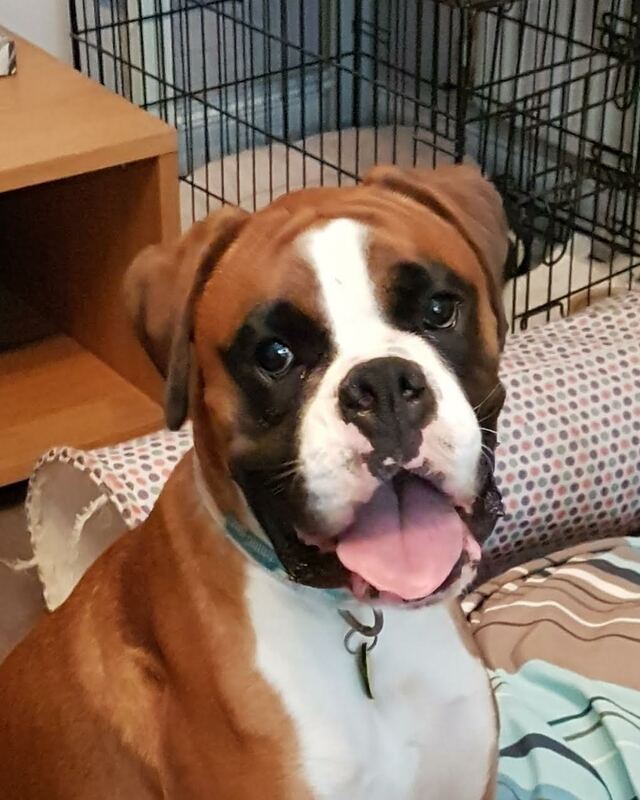 Denzel came into HCBW at just 5 months old on 11 May 2018 as he just wasn't coping when left for even very short periods of time. It didn't take him long to find his forever home, he was already off and meeting them on 13 May 2018. Denzel has found the perfect home where he gets attention 24/7 and where he can learn to become a calm, relaxed dog at his own pace. Denzel has already made his mark with his new family and gave them quite a fright when he needed an emergency operation at the end of May due to a retained testicle but he recovered very quickly and is back running around and keeping them entertained. We wish Denzel and his new family all the very best for many years to come! Henry the gorgeous 2.5 year old bob-tail boy came into HCBW in April 2018 and went off to his new forever home on 13 May 2018. Henry was looking for a special home where someone was around for most of the day and where he could get continued support and training. He now lives with a lovely couple who love him to bits. He enjoys snoozing in the office whilst his Dad works away and taking breaks in the garden before heading off for long walks in the beautiful South West. One of his favourite places is the couple's bed where he has decided to keep all his toys! We wish Henry and his new family all the very best! Buster, (previously known as Kanya) but affectionately known as Buz, was given over to HCBW just 1 week before Christmas in 2017. He was 2 years old. He came straight into foster care and proved to be quite a handful for his fosterers. However, given time, firm discipline, lots of training and exercise, he has become a truly wonderful companion and was adopted by the foster family just a couple of months later. His training continues and he has settled very well. 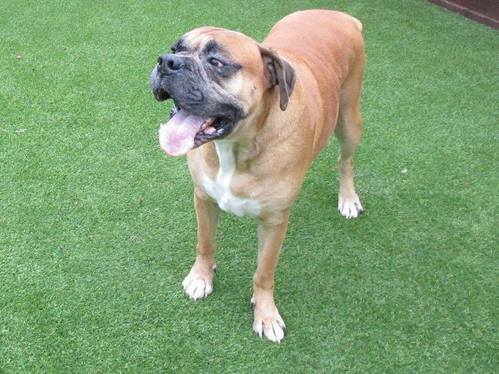 He is super friendly and a very sociable Boxer. He is completely adored by his new family who are quite fond of his cuddly nature. Good luck in your new home Buz! 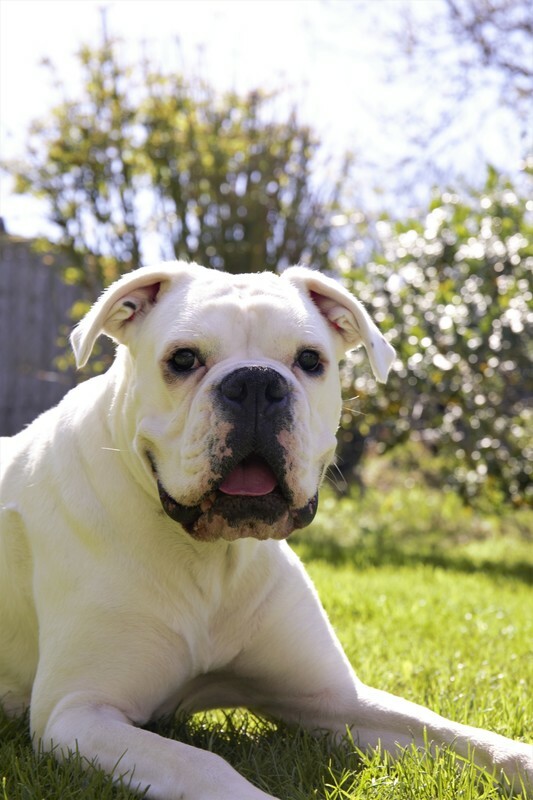 ​Crumpet (was Martha) came into HCBW in September 2017 at just 7 months old as she was being bullied at home by the other 2 resident Boxers and was not allowed to play with toys and was just too much of a handful. Crumpet was re-homed with a 4.5 year old brindle Boxer girl called Marmite, who is practically her twin. They got on from the moment they saw each other and share all their toys, play together continuously and eat and sleep together with no issues whatsoever. Crumpet's training is still on-going as she is quite attention seeking and can be destructive when ignored!